Six months ago, Sloane Stephens couldn’t walk. On Saturday afternoon, she brought 23,000 people to their feet. Playing near-flawless tennis in her first Grand Slam final, Stephens committed just six unforced errors to defeat Madison Keys, 6-3, 6-0, before a capacity Arthur Ashe Stadium crowd in the first all-American US Open final since Williams vs. Williams in 2002. In a women’s draw littered with upsets – only two Top 10 seeds reached the quarterfinals and no Top 8 seeds advanced to the semis – it seemed appropriate that the unseeded Stephens emerge as the champion, joining 2009 Open winner Kim Clijsters as the only unseeded women to accomplish that feat in the Open era. That she did so at Keys’ expense was heartbreaking for the U.S. tennis fans in attendance, who seemed torn between the two young Americans. But this day was all about Stephens, the charismatic, lightning-quick baseliner who missed last year’s US Open with a foot injury that required surgery and forced her off the tour for 11 months. She just returned this year at Wimbledon and lost in the opening round, and she followed that with another first-round loss in Washington D.C.
Toting a ranking that had plummeted to No. 957, Stephens entered the US Open Series with little to lose, and suddenly, she discovered her old form, only somehow better. Surprise semifinal runs in Toronto and Cincinnati gave her a boost of confidence – as well as lifted her ranking back into the Top 100 – and she arrived at the Open with the momentum she needed to make a deep run. Still, few expected a run quite this deep – or that her first title since her return would be the first Grand Slam title of her career, won at her home-country Slam, just months after being relegated to her couch and fearing for her tennis future. But when the last Keys’ forehand went awry, Stephens covered her face, pumped her fist, embraced her friend at the net and raised her arms to the sky. She was no longer a great comeback story, or a promising young American. She was the 2017 US Open champion. Sloane Stephens has made a career out of absorbing and redirecting pace, defusing the power play of the game’s biggest hitters with her compact strokes and by tracking balls sideline to sideline with her unparalleled speed. But she has never done so quite like she did on Saturday. Stephens betrayed no nerves in the biggest match of her career, committing a paltry six unforced errors over two brilliant sets to win her first US Open title and maiden Grand Slam championship, 6-3, 6-0, over fellow American Madison Keys. The match was a master class in patience and consistency from a 24-year-old who admitted she is still learning to exercise both. She routinely baited her big-hitting friend and rival into repeated errors; Keys finished with 30 unforced in all, accounting for half the points Stephens won. At the start, it appeared the match would be another tight tilt reminiscent of Stephens’ dramatic quarterfinal victory over Anastasija Sevastova and her heart-stopping semifinal win over Venus Williams. But Stephens broke Keys at 2-2 to gain an early advantage and consolidated to go up 4-2. Keys would close the gap to 4-3 but could not break back. And from there, it was all Stephens, the Floridian running off the match’s last eight games to earn the crown. Appropriately enough, the match ended on a quintessential Stephens point. She returned serve and then settled in at the baseline, striking the ball firmly off both wings, deflecting a mammoth Keys’ forehand, and on the 11th shot, watching, ready for one more, as Keys’ final forehand found the net. It was over. 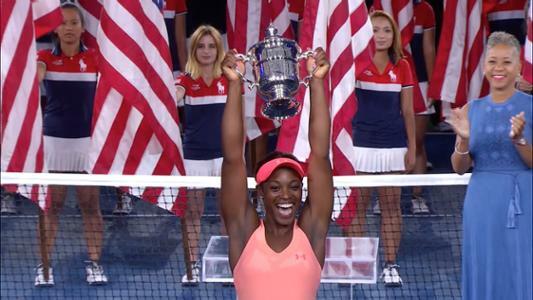 Stephens was the champion, a first-time champion – and a most deserving one at that. Twenty years after she captured the US Open singles championship as a 16-year-old, Martina Hingis is still winning titles in Flushing Meadows. 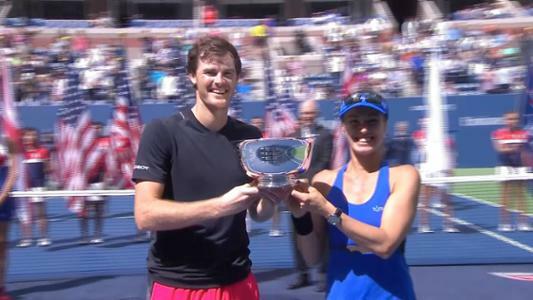 On Saturday, she teamed with Jamie Murray to take the mixed doubles crown with a dramatic 6-1, 4-6, [10-8] victory over Michael Venus and Hao-Ching Chan, the sister of Hingis’ doubles partner, Yung-Jan Chan. And on Sunday, Hingis and Yung-Jan will compete for the women’s doubles championship, and a victory that would give Hingis a sweep of the women’s doubles and mixed doubles titles for the second time in three years. (She also did so in 2015.) The only other players to sweep both titles in the same this year this century are Rennae Stubbs in 2001, Cara Black in 2008 and Andrea Hlavackova in 2013. Coco Gauff entered the 2017 US Open Junior Championships as a much-heralded future star, with the emphasis on future. At just 13, playing against girls three and four years her senior, she was expected to flash her future potential, perhaps, but not much more. On Saturday, the young American with big-time game and lanky 5-foot-10 frame stunned Argentina’s Maria Lourdes Carle, 7-5, 6-0, to set up the second all-U.S. final in as many days. Gauff, a wild-card entry into the draw, will face compatriot Amanda Anisimova, the fourth seed, in the girls’ singles final Sunday afternoon. It is the third consecutive all-American Grand Slam singles final – following Whitney Osuigwe’s victory over Claire Liu at the French Open and Liu’s win over Ann Li at Wimbledon – with the winner set to become the second American in a row to claim the girls’ crown here, after 2016 champion Kayla Day. It would be a stunning achievement for Gauff, who is playing in her first Grand Slam junior event, and perhaps an indication of things to come, when Sloane Stephens and Madison Keys may have a new rising star to contend with. 8: The number of American women who have won US Open singles titles, after Sloane Stephens defeated Madison Keys on Saturday to become the event’s newest champion. With her victory, Stephens joins six-time champions Chris Evert and Serena Williams, four-time winner Martina Navratilova, three-time champ Billie Jean King, two-time titlists Tracy Austin and Venus Williams, and 1998 winner Lindsay Davenport. “I should just retire now. I told Maddie earlier, I’m never going to top this.” – Sloane Stephens, on coming back from No. 957 in the world earlier this year to win the US Open title Saturday with a 6-3, 6-0 victory over Madison Keys. The US Open officially draws the curtain on the 2017 Grand Slam season Sunday afternoon with the men’s singles final pitting top seed, two-time US Open winner and 15-time Grand Slam Rafael Nadal against No. 28 seed Kevin Anderson, appearing in his first major final. The two 31-year-olds have enjoyed relatively smooth rides into the title match. Both have lost just three sets through six matches and neither has yet been stretched past four sets in any one encounter. That is where their similarities end. Nadal is playing in his fourth men’s singles final in Flushing Meadows, pursuing his third title; Anderson had never previously been past the quarterfinals at a major. Nadal’s game is predicated on his whipping, diving ground strokes and exceptional court coverage; Anderson’s is a pure power game propelled by a big serve and driving ground game; the lefty Nadal is attempting to join Jimmy Connors, Roger Federer, Ivan Lendl, John McEnroe and Pete Sampras as three-time US Open champions; the righty Anderson is the tallest (6-foot-8) and lowest-ranked (No. 32) man to compete for the crown since the advent of the computer rankings in 1973. Of course, none of that matters once the first ball is struck on Sunday. Then it’s just two men pursuing the same goal, with the last man standing to be crowed US Open champion.